Starring: Elisa Del Genio, Ludovica Nasti, Gaia Girace, Margherita Mazzucco, Anna Rita Vitolo, Luca Gallone, Imma Villa, Antonio Milo, Alessio Gallo etc. The quality of Italian produced TV dramas in recent years has been spectacularly high. I devoured three bloody seasons of the macho-gangster brutality of Gomorrah (2014 – 2017) with both shock and enthusiasm. I subsequently imbibed avidly the magisterial and philosophical depth of Paulo Sorrentino’s The Young Pope (2016). Thus, expectations were equally raised by HBO’s production of My Brilliant Friend; my confidence eventually rewarded with a moving, fiery, sensual, violent and intelligent drama about friendship and family rivalries. 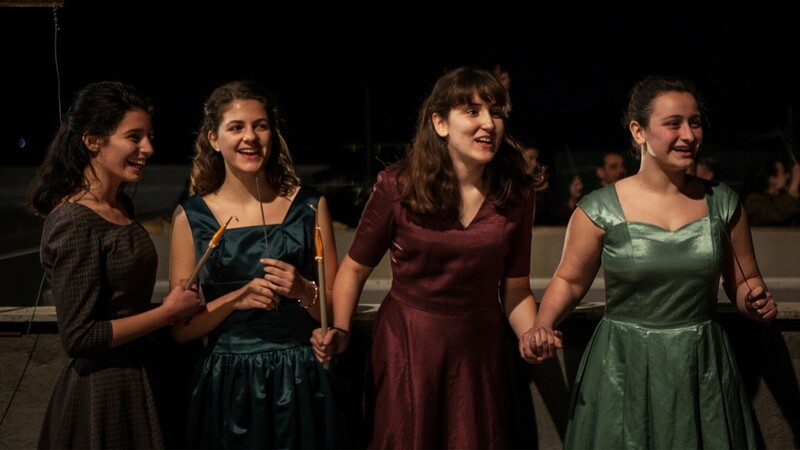 Based on the first of four Neapolitan novels written by Elena Ferrante, the drama charts the lives of various families who inhabit a 1950s Naples neighbourhood. It’s a traditionally working class environment, set amongst run down blocks with cars travelling along dusty roads which lead to the city, country or sea. While encompassing a large ensembel cast, the story focusses on two specific characters: “Lenu” Greco and “Lilu” Cerullo. Forging a powerful friendship in their primary school years, the narrative unfolds over a ten-year period until they are sixteen. Their lives become entwined in family dramas, fights, romances and death, as both characters rival and connect with each other and those in the neighbourhood. Class differences underpin the various plots and sub-plots with Lilu displaying incredible academic acumen but held back as her family are too poor to send her to school. Galvanised by competition Lenu pushes herself to get ahead of her friend and despite such division the two are drawn together when facing seemingly insurmountable emotional odds. As such, their friendship and loyalty toward each other drives the story powerfully. Lilu, while contrary and irritating at times, is passionate and principled, while Lenu is more passive and demure. Yet, together they form a resilient whole. The performances from the cast are brilliant, while the production overall is a thing of beauty. Max Richter’s score is sumptuous and haunting, with the era, setting and locations all wonderfully evoked. But it’s not nostalgia for happier times, rather an honest examination of humanity and rites of passage struggle through puberty and into adulthood. While the sun shines brightly in Naples, these are ultimately hard times. The many stories unfold in sand-hit tenement blocks where men, women and children struggle to make ends meet. Moreover, the show prefaces sisterhood as a means to overcome the misogyny and sexual exploitation of the era. Toxic masculinity dominates throughout, with men represented as either: sexual predators, gangsters, wife-beaters and Catholic Priests. There are some positive male role models and there is a whiff of solidarity in the air as Communist doctrine is presented; however, there is no escape for the working classes other than to die or struggle onwards. Lastly, the only way out for Lenu and Lilu is sticking and fighting together; educating themselves academically and emotionally to grow and gain the experience necessary to cope with the slings and arrows of Neapolitan life.